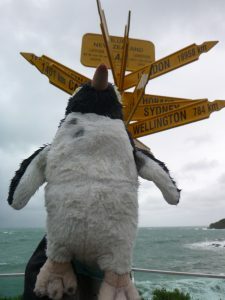 Long time Yellow-eyed Penguin Trust supporter and volunteer Katie Underwood successfully completed the Tour Aotearoa (TA) in March, and raised over $3700 for the Trust. The 3000km bike ride from Cape Reinga to Bluff follows a combination of cycle trails, tracks, paths and lanes connected by country roads, and all participants choose a charity to raise money for. Upon returning home to Wellington, Katie answered some questions about what drives her and why she chose to support hoiho this year. How and when did you first become a supporter of the Yellow-eyed Penguin Trust? I have always been interested in the YEP as one of our endangered species. Acting on my interest came with the opportunity to visit the Auckland Islands. I’ve read and been fascinated by the stories of shipwreck survivors in the Auckland Islands – the endurance they showed in their situation is amazing. When the chance arose to actually visit these places it was just too good to pass up. And it came about through volunteering with DoC on their YEP survey as a volunteer. So it was perfect – holiday, conservation, remote area, no cell coverage, no email. Some days I would be the only person on a small island for a few hours with tui and YEP for company. Why cycling? You’ve done the Tour Aotearoa before, was once not enough?! Cycling is such a fun way to get away and get around. There is a real sense of freedom cycling quietly through forests and along beaches. The TA is something that just about anyone can do. You don’t have to be a top cyclist, mechanic, navigator or outdoors person – just be stubborn and have a credit card. There is you, your bike and the track in front of you. The TA is not a race, so you can do as much or as little as you like as long as you average out at 100kms per day. Sometimes I’d ride more than 100 and some days I’d ride less. What was the most memorable and the most difficult part about the Tour? New Zealand is a great country full of fantastic scenery and people. The joy can be as simple as a sign in the middle of nowhere that says ‘Pedal On TA Riders’ or the kids at their gate offering riders cool melon to eat. The serendipitous meeting of people who are avid dot watchers and come out to say hello. (We all wear spot trackers so we can be traced if we set off the SOS button). The satisfaction of completing a fantastic day of cycling and being at one with the bike over lovely trails. One thing I loved was sitting in the forest at Maruia Saddle, watching while robin attacked my YEP soft toy. The sun had come out, I was eating blue cheese and I’d ridden 95% of the uphill. The robin really went for my stuffed YEP friend and tried to pluck out his eyes! The most difficult part was the last day. It was the worst weather in all 2 and a half times I’ve done the TA. A head wind of 39 knots not including gusts that would blow me off my bike, rain for 6 hours with temperatures dropping below 12 degrees. It did cross my mind that it was weather more suited to penguins. I listened to music but it was hard to hear over the weather and I also swore a bit on the last 20kms. I was so very very pleased to see Thomas from the Mossburn Hotel at the end to meet us. When you talk to people about raising money for YEPs, what is their response? Do they understand the current situation of the population decline? A lot of people donated because they know me and that I’d make them donate if they didn’t offer 🙂 Some donated because the enormity of doing the TA is something they find difficult to contemplate and are grateful it is me doing the cycling and suffering. It was fun. People I met on the West Coast Wilderness Trail were on the Arrowtown Trail a week later. They called me the Penguin Lady. Those that didn’t know about the plight of the YEP do now. I am always humbled by the amount of money people donate and that complete strangers make donations. What’s your next event and cause going to be? Hmmm, probably the Megagrind in November. But never say never for the TA again. As for a cause, something conservation related most likely. A huge thank you to Katie from all of us at the Trust. We are truly grateful for her hard work and determination and the money raised will be used to help us continue our conservation programme across Otago, the Catlins, Rakiura (Stewart Island) & Whenua Hou (Codfish Island). If you’re interested in organising an event to raise funds for our endangered hoiho, get in touch with us at admin@yeptrust.org.nz – we’ve got some great ideas and there are always events you can get involved in.